Increase fondness level with your patrons and get more rewards. Pick a wine catering to your customer's preference and your wine sales double! If your store grade increases, a customer with new style will be added. Bookmark your close friends and visit them easily. Send puzzles to your friends and request some for yourself. You can buy special costumes with the puzzles send by your friends. You can obtain wine from the Happy Market with a certain probability. You can't pbtain wine when your wine cellar storage is full. Increase your menu level so that you can set various set menus. It also boosts your sales efficiency. Succeed in serving a passer by and one of your dish will be sold. Harvest pasta in fresh condition to increase yield by 20%! Throw a party at your restaurant. Exciting events await! You can add better set menus depending on your employees cooking index. Employees with higher attraction index earns more tips and increases your store grade. Enhance your employees dress. Their cooking skill, attraction and HP index will boost. 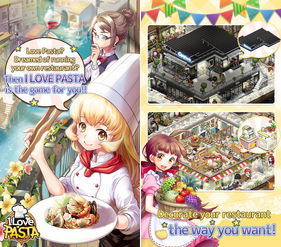 Run a social shop at your friend's restaurant. You and your friend will get a special reward once a day. Food sale speed depends on the number of level-matching chairs and operable stoves/ovens. You can send up to 2 employees to 1 market. Dye your animal costumes and get different animal costumes. Use cash to expand the 2nd floor even before you reach level 30. Collect bingo stickers and begin to play bingo with your customers! Don't miss out on the awesomely rare rewards! Keep your eyes peeled for bingo stickers here and there at your friends restaurant! Help your friend with the business every day! Your party points go up and up!